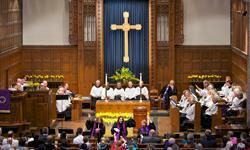 Welcome to the First Presbyterian Church of Ann Arbor! Come visit us - everyone is welcome. We worship a living God who calls us to love and support one another. Together we can do marvelous things – and grow closer to God and one another along the way. If you are new to us we invite you to visit and explore our many programs and service opportunities. Our mission is to grow spiritually as disciples of Jesus Christ through worship, fellowship, mission, learning and prayer. We commit ourselves, in all we say and do, to demonstrate God's grace and love. We do this through rich worship services, education classes, and active participation in local and global service. Christ's admonition in John 20:21 - "As the Father has sent me, so I send you" - guides our actions. First Pres provides you the worship, educational and service opportunities of a large church, while at the same time offering you the warmth and closeness of a small church in our small group ministries. Our Youth and Childrens' ministries provide your children with a rich set of experiences and life lessons that will guide them as they mature in the Christian faith. Want to know more? If you are visiting us for the first time you may be wondering about many details - what a service is like, where do I park, what should I wear, directions, etc., you can find out more here on our "Visit Us" page. Rev. Melissa Anne Rogers directs the ministries of care, compassion, and sympathy. If you are seeking pastoral care or spiritual support, or are going through a difficult time and would welcome prayer, contact Rev. Rogers, Associate Pastor for Pastoral Care and Congregational Life, at mrogers@firstpresbyterian.org, or (734) 662-4466 x390. Rev. Jay Sanderford guides the core areas of Adult Education, Mission, and the Resident Minister Program at First Presbyterian. He can be reached at jsanderford@firstpresbyterian.org, or at (734) 662-4466 x340. If you have children in your family ranging in age from infant to grade schooler, Beca Torres-Davenport, our Transitional Director of Children's Education and Family Ministries, is happy to talk to you about the children's programs at First Pres. Beca can be reached by phone at (734) 662-4466 x342, or by email at btorres-davenport@firstpresbyterian.org. 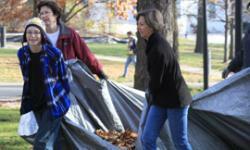 First Pres Ann Arbor nurtures youth's spiritual growth through community, education, and fun. Call us at (734) 662-4466 to learn more. 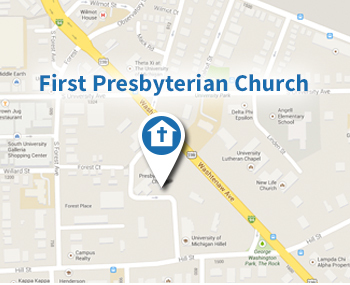 If you are a college student looking for a Christian community, please email us at info@firstpresbyterian.org. You can also find more information on the Campus Ministry here at First Pres at http://firstpresbyterian.org/connect/campus-ministry. If you are in your 20's or 30's, we have an active program of mission, service, and social events. See our T2A2 page http://firstpresbyterian.org/connect/adult-ministry/t2a2-twenties-thirties for more information or contact Sandy Talbott at stalbott@firstpresbyterian.org. We have an active Senior Ministry run by the Rev. Melissa Anne Rogers, Associate Pastor for Pastoral Care and Congregational Life. Melissa Anne's phone number is (734) 662-4466 x390. Her email address is mrogers@firstpresbyterian.org. Rev. Rogers also directs the ministries of care, compassion, and sympathy. We are also blessed to have a Parish Nurse, Sandy Talbott, RN, who directs our health ministry and is available to answer questions about your health, check blood pressures, and help with referrals and health-related questions. Her number is (734) 662-4466, ext. 350, stalbott@firstpresbyterian.org. The church office may be reached by telephone at (734) 662-4466 during business hours. Phone messages may be left after hours. General questions may also be directed to info@firstpresbyterian.org, where they will be forwarded to the appropriate staff member.